I work for the public schools, and while I’ve worked on and off doing various things since summer school ended July 3rd, I haven’t had a steady 8-hour job where I have to get up early etc. Today I substituted at a preschool at 7am. Today was the test! I was able to fit in oil pulling and while I was doing so, I made breakfast. Green smoothie + 2 over easy eggs with onions + water. Recipe for the green smoothie can be found here. Result? I was able to fend off hunger until lunch time at 11:30! (I ate breakfast around 6am.) I’m very pleased. If I eat just one of these items by itself, especially just the onion-y eggs, I get hungry in a few hours. That will NOT fly with my regular job. I keep cut onion in a glass container in my fridge. It’s cut in slices, so in the morning I just cut into little pieces straight into the pan that I’ve greased with a tiny bit of organic, unrefined coconut oil (the same stuff I use for oil pulling.) Then I crack the eggs into the pan (it’s heated up by that time.) Sometimes I make them scrambled, but I’m working on my over-easy skills for my husband’s sake (that’s his favorite). Tomorrow I might add toast, because I know you’re supposed to consume the majority of your calories at breakfast time. I just have to make sure nothing too sugary is on the toast so my blood sugar doesn’t crash. What do you eat for breakfast? How long does it last? 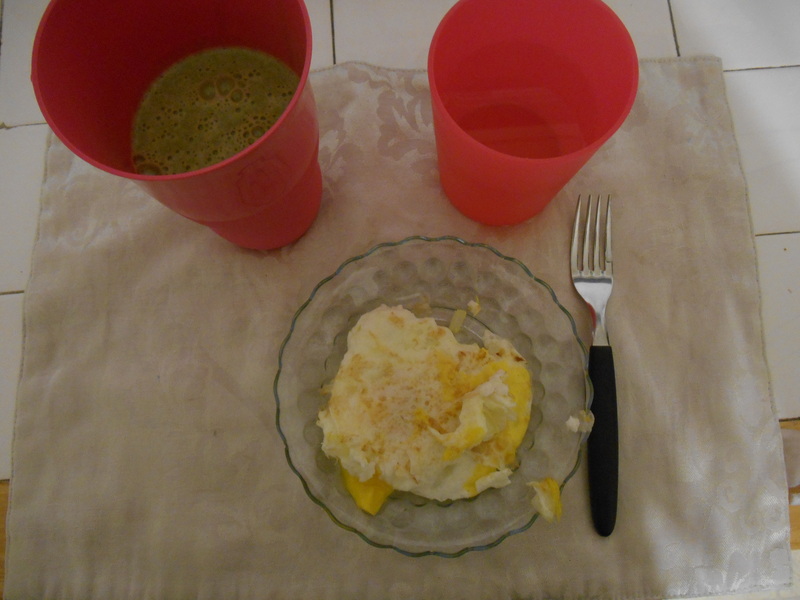 This entry was posted in Health, Recipe and tagged breakfast, eggs, health, recipe, smoothie. Bookmark the permalink.